Pedro's Point of View: Is Barca's backline strong enough? 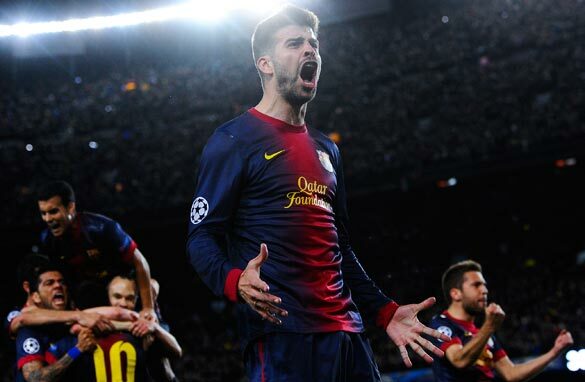 With Carles Puyol and Javier Mascherano out, much is expected of Gerard Pique. (Getty Images). Carles Puyol is out. Javier Mascherano is out. All of a sudden, Barcelona have yet another defensive crisis ahead of a crucial Champions League game against Paris Saint-Germain. At a time when speculation regarding a big money move for Neymar continues to grab the headlines, is signing another forward really a priority at the Camp Nou? Securing a top defender would be a better investment. Without one, future European campaigns could proves fruitless. Before arguing the need to bring in another centre back, I will make it clear that I understand how Barcelona play and why they haven’t previously invested a lot of money in bringing in high-profile defenders. Their football philosophy focuses on keeping the ball as long as possible, and when they lose it winning it back high up the pitch. Therefore, when selecting a central defender, the priority is to get a great passer, rather than a great tackler. Look at how the likes of Mascherano, Sergio Busquets and Alex Song have all often been played in defense when they are natural midfielders. The only proven central defenders Barcelona have right now are Puyol and Gerard Pique and that is simply not good enough for big games against big teams. We all know how good Puyol has been for Barca, but his best days are behind him, and when Pique is out of form, as he has been this season, the team struggles to keep clean sheets. This season, Barcelona have already conceded 33 goals in 30 league games, a much higher total than you would expect. They have been leaking goals at a higher rate than any other table-topping team in Europe’s traditional top leagues. There is a problem there and Barcelona’s directors and coaching staff should address it. Over the last couple of seasons the club has brought in a few attacking players, the likes of Ibrahim Affelay and Alex Sanchez, who haven’t made much of an impact. Wouldn’t that money have been better spent on a top defender? Just imagine if Barcelona would have bought someone like Thiago Silva or Leonardo Bonnucci? How good would they be then? To be fair, Barcelona did try, once, to bring in a international defender but they didn’t pick the right one. In 2009, the Catalans signed Dmytro Chygrynskiy from Shakhtar Donetsk, but the Ukrainian stopper failed to settle and a series of injuries meant he was unable to get a long run in the team. The move backfired and the player was eventually shipped out without ever living up to expectations. So the issue remains, and while they are still favourites to beat PSG without the likes of Puyol and Mascherano, the question is, if their injury worries continue, can Barcelona lift the trophy this season? Will a back line without two pure central defenders be good enough to beat Bayern Munich, Borrussia Dortmund, Juventus or Real Madrid? Having the magical Leo Messi means Barca will always score, but I am not so sure they can keep enough clean sheets to be champions. Nice text, let's see how Barca will do without Messi and how many goals can Ibra score today ?! Pedro, I can feel your pulse here. Barcelona have to make a move for a natural defender else it will spell doom for them sooner than later. It was so obvious at the El-classico when their defenders couldn't hold back the Madrid attack. They were unable to beat Real Madrid on three different occasions. I hope they survive the semi finals because all the clubs that have made it to the semi finals have solid attackers that are so so fast and great defenders that can hold their own. Barca, please take Pedro's advice and survive the heat that will soon come your way else, there will be crisis in the kind of result you will turn out later. with us in Barcam we do not have any player on a particular position. we are going in for defeat, in germany and not to be defeated, so we are not scared of the backline, we always make surprises. Most of the time Barça plays in the opponents half but on quick counter attacks the goal tender gets exposed. It happened last night and it is going to happen again. The Blaugrana need some quick answers to fortify their back four.